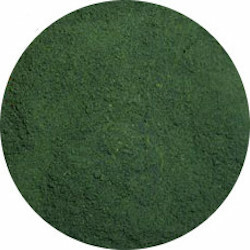 Chlorella is similar to Spirulina, with an emphasis on nucleic acid and chlorophyll. Chlorella is more expensive than Spirulina because is has an out cell wall that has to be carefully broken to improve digestibility. This outer cell wall binds with heavy metals, pesticides and other toxins to help elimination of them from the body. The polysaccharides in the outer cell wall stimulate interferon productivity and can help act as an anti-tumor and enhance immunity. The belief that like heals like suggests that the outer cell wall of Chlorella may strengthen our outer cell walls to ward off invasion by foreign organisms and/or toxins. Chlorella's nucleic acid has similar benefits to Gynostemma when it comes to protecting RNA/DNA. Nucleic acid is depleted by unnatural living such as lack of exercise, pollution, poor diet and stress. In Traditional Chinese Medicine an imbalance referred to as wind-damp, that can manifest as multiple sclerosis, nervousness, palsy, seizures, sciatica and other nerve disorders, may be helped by eating Chlorella. Chlorella has more fatty acids than Spirulina and Wild Blue-Green Algae. Fatty acids reduce cholesterol and help prevent atherosclerosis. Chlorella is generally not used for fighting obesity.